Amarillis, a baroque ensemble with a variable line-up, currently ranks amongst the most original groups in Europe. 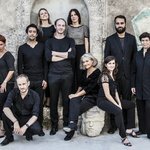 Amarillis, a baroque ensemble with a variable line-up, currently ranks amongst the most original groups in Europe. It was created by Héloïse Gaillard, the flautist and oboist who is also in charge of the Ensemble’s artistic direction, and Violaine Cochard, harpsichordist and vocal coach. The Ensemble has been awarded three international first prizes. The Ensemble’s discography of 17 CD recordings has been lauded by critics in the national and international press. 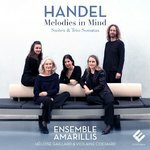 Their 18th CD, released by Evidence Classics in March 2017, put forward the composer George Frideric Handel with Suites and Trio sonatas recorded in partnership with the Philharmonie de Paris and the Musée de la Musique. Internationally renowned, Amarillis performs regularly in the greatest festivals in France and abroad (tours supported by the French Institute) and collaborates regularly with today’s finest singers and brings together musicians of confirmed talent in the same spirit of chamber music. Amarillis can regularly be heard on France Musique and Radio Classique. The BBC, Mezzo, France télévision and Arte have videotaped many of the Ensemble’s concerts. Amarillis is supported by the French State – the Pays de la Loire regional cultural affairs department – the Pays-de-la-Loire Region, and the City of Angers. In 2016-2017, it received a grant from ADAMI. It belongs to the Fédération des Ensembles Vocaux et Instrumentaux Spécialisés.